Here is a recording of Hymn No. 16 from the “Hymns of Dawn” to aid God’s people in singing and making melody in their hearts unto God. Ever seek the mercy seat. Christ, to thee, our glorious King. Author — W. Chatterton Dix (William Chatterton), 1837-1898. Composer — Adapted from Conrad Kocher (1786-1872); arranged by William Henry Monk (1823-1889) in 1861. Our Master tells us that it is because of the narrowness of this way that the many prefer to remain on the broad road to destruction (Matthew 7:14). Before considering this way and its dangers and difficulties, let us notice the end to which it leads—life—which may be enjoyed on various planes of being, but here our Lord uses it in reference to that highest form of life, pertaining to the divine nature—immortality—the prize for which he invited us to run. The Divine Being, Jehovah, is the great fountain of all life, from which all these springs are supplied. All living things result from and depend on Him for life. The creature is in no sense a part or an offspring of the Creator’s essence or nature, but he is God’s handiwork infused with life. Only in the divine nature is life independent, unlimited, exhaustless, ever continuous and neither produced nor controlled by circumstances. Immortal signifies death-proof, consequently disease and pain-proof; it may be used as a synonym for divinity. From the divine, immortal fountain proceed all life and blessing, every good and perfect gift, as from the sun the earth receives her light and vigor. The sun is the great fountain of light to the earth, illuminating all things, producing many varieties of color and shades of light, according to the nature of the object upon which it shines. The same sunlight shining upon a diamond, upon a brick, and upon various kinds of glass, produces strikingly different effects. The light is the same, but the objects upon which it shines differ in their capacity to receive and to transmit it. The polished diamond is so adapted to the light that it appears as though it possessed it within itself, and were itself a miniature sun. So with man, one of the masterpieces of God’s creation, made only “a little lower than the angels.” He was so grandly formed as to be able to receive and retain life by the use of the means which God supplied, and never grow dim. Yet as the diamond can reflect no light except when shone upon by the sun, so man can possess and enjoy life only as the supply of life is continued. Man has not inherent life: he is no more a fountain of life than a diamond is a fountain of light. One of the strongest evidences that we have not an exhaustless supply of life in ourselves, or, in other words, that we are not immortal, is that since sin entered, death has passed upon all our race. God had arranged that man in Eden should have access to life-sustaining trees, and the paradise in which he was placed was abundantly supplied with numbers of “every [kind of] tree” good for food or for adornment (Gen. 2:9,16,17). Among the trees of life good for food was one forbidden. While for a time forbidden to eat of the tree of knowledge, he was permitted to eat freely of trees which sustained life perfectly; and he was separated from them only after transgression, that thereby the death-penalty might go into effect (Gen. 3:22). Thus the glory and beauty of humanity are seen to be dependent on the continued supply of life, just as the beauty of the diamond is dependent on the continued supply of sunlight. When sin deprived humanity of the right to life, and the supply was withheld, immediately the jewel began to lose its brilliancy and beauty, and finally it is deprived of its last vestige in the tomb. His beauty consumes away like a moth (Psa. 39:11, Job 14:10, 21). “For there is no work, nor device, nor knowledge, nor wisdom, in the grave whither thou goest” (Eccl. 9:10). But since a ransom has been found, since the death penalty has been provided by the Redeemer, the jewel is to have its beauty restored, and is again to reflect perfectly the Creator’s image when the Sun of Righteousness shall arise with healing in his wings (Mal. 4:2). 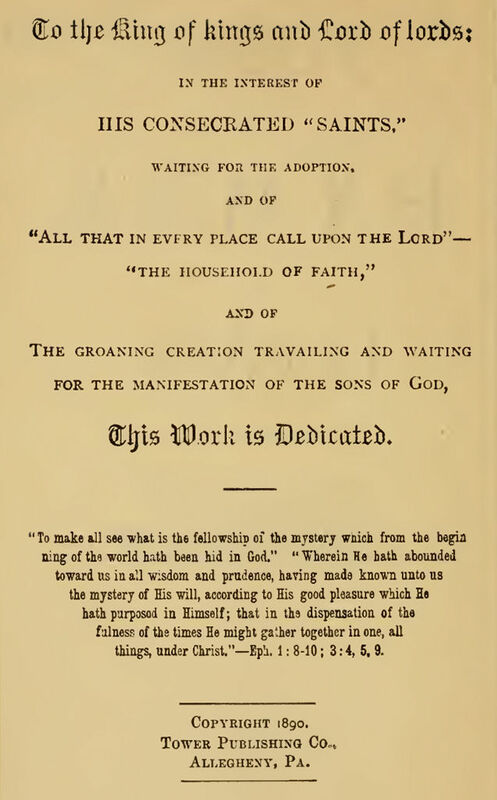 It is because of the sin-offering, the sacrifice of Christ, that “All that are in their graves shall come forth.” There shall be a restitution of all things; first an opportunity or offer of restitution to all, and ultimately the attainment of human perfection by all who will obey the Redeemer. This, however, is not the reward to which Jesus refers as the end of the narrow way. The reward promised to those who walk the narrow way is the “divine nature”—life inherent, life in that superlative degree which only the divine nature can possess—immortality. Dare we aspire to such a height of glory? Surely not without positive and explicit invitation could any rightfully thus aspire. From 1 Tim. 6:14-16 we learn that the immortal or divine nature was originally the possession of divinity only. We read: “He [Jesus] in his time [the Millennial age] will show who is the blessed and only potentate—the King of kings and Lord of lords, who only hath immortality, dwelling in the light which no man can approach unto, whom no man hath seen nor can see.” All other beings, angels, men, beasts, birds, fish, etc., are but vessels holding each its measure of life, and all differing in character, capacity, and quality according to the organism which it has pleased the Creator to provide for each. Jehovah, who alone possessed immortality originally, has highly exalted his Son, our Lord Jesus, to the same divine, immortal nature; hence he is now the express image of the Father’s person (Heb. 1:3). So we read, “As the Father hath LIFE IN HIMSELF [God’s definition of “immortality”—life in himself—not drawn from other sources, nor dependent on circumstances, but independent, inherent life], so hath he given to the Son to have LIFE IN HIMSELF” (John 5:26). Since the resurrection of the Lord Jesus, then, two beings are immortal; and, amazing grace! the same offer is made to the Bride of the Lamb, the “little flock” of overcomers, being selected during the Gospel age… who so run as to obtain the prize; who follow closely in the Master’s footsteps; who, like him, walk the narrow way of sacrifice, even unto death. These, when born from the dead in the resurrection, will have the divine nature and form. This class is not to be raised from the tomb as human beings; for we are assured by the Apostle that, though sown in the tomb natural bodies, they will be raised spiritual bodies. These all shall be “changed,” and even as they once bore the image of the earthly, human nature, they shall bear the image of the heavenly. But “it doth not yet appear what we shall be”—what a spiritual body is; but “we know that when he shall appear, we shall be like him,” and share in “the glory to be revealed” (1 John 3:2, Col. 1:27, 2 Cor. 4:17, John 17:22, 1 Pet. 5:10, 2 Thess. 2:14). Not only is this high calling to a change of nature confined exclusively to the Gospel age, but it is the only offer of this age. All others are still on the broad road—these only have as yet escaped the condemnation that is on the world. This, the only way of life now open, because of its difficulty, finds few who care to walk in it. The masses of mankind in their weakness prefer the broad, easy way of self-gratification. The narrow way, while it ends in life, in immortality, might be called a way of death, since its prize is gained through the sacrifice of the human nature even unto death. It is the narrow way of death to life. Being reckoned free from the Adamic guilt and the death penalty, the consecrated voluntarily surrender or sacrifice those human rights, reckoned theirs, which in due time they, with the world in general, would have actually received. As “the man Christ Jesus” laid down or sacrificed his life for the world, so these become joint-sacrificers with him. Not that his sacrifice was insufficient and that others were needed; but while his is all-sufficient, these are permitted to serve and to suffer with him in order to become his bride and joint-heir. So, then, while the world is under condemnation to death, and is dying with Adam, this “little flock,” through the process of faith reckonings and sacrifice, are said to die with Christ… in order to become partakers of the divine nature and glories with him; for we believe that if we be dead with him, we shall also live with him. If we suffer with him, we shall also be glorified together (Rom. 8:17, 2 Tim. 2:11,12). In the beginning of the Millennial age, those who now walk the narrow way will have gained the great prize for which they ran, immortality; and being thus clothed with the divine nature and power, they will be prepared for the great work of restoring and blessing the world during that age. With the end of the Gospel age, the narrow way to immortality will close, because the select “little flock” that it was designed to test and prove will have been completed. “Now is the accepted [Greek, dektos, acceptable or receivable] time”—the time in which sacrificers, coming in the merit of Jesus and becoming dead with him, are acceptable to God—a sacrifice of sweet odor. Death, as the Adamic penalty, will not be permitted forever; it will be abolished during the Millennial age; as a sacrifice it will be acceptable and rewarded only during the Gospel age. It is only as “new creatures” that the saints of this age are on the way to life; and only as human beings are we consecrated to destruction, as sacrifices. If, as human creatures, we be dead with Christ, as new, spiritual beings, we shall live with him (Rom. 6:8). The mind of God in us, the transformed mind, is the germ of the new nature. The new life would be easily choked; and Paul assures us that when begotten of the spirit through the truth, if we live after the flesh, we shall die (lose our life), but if we, through the spirit, do mortify (put to death) the deeds of the body (the disposition of the human nature), we (as new creatures) shall live; for the sons of God are those led by the spirit of God (Rom. 8:13,14). This is a thought of utmost importance to all the consecrated; for if we have covenanted with God to sacrifice the human nature, and if that sacrifice was accepted by him, it is useless to attempt to take it back. The human is reckoned of God as dead now, and must actually die, never again to be restored. All that can be gained, then, by turning back to live after the flesh, is a little human gratification at the expense of the new spiritual nature. (1 John 2:15; John 5:44). These, who love the present world, but who have not wholly forsaken the Lord and despised their covenant, receive a scourging and purifying by the fire of affliction. As the Apostle expresses it, they are delivered over to Satan for the destruction of the flesh, that the spirit (the newly begotten nature) may be saved in the day of the Lord Jesus (1 Cor. 5:5). And if rightly exercised by the discipline, they will finally be received into the spiritual condition. They will have everlasting, spirit life as angels have it, but will lose the prize of immortality. They will serve God in his temple, and stand before the throne, having palms in their hands (Rev. 7:9-17); but though that will be glorious, it will not be so glorious as the position of the “little flock” of overcomers, who will be kings and priests unto God, seated with Jesus in the throne as his bride and joint-heir, and with him crowned with immortality. Ours is a rugged, steep, narrow way, and were it not that strength is furnished for each successive step of the journey, we could never reach the goal. The difficulties of this way are to act as a separating principle to sanctify and refine a “peculiar people” to be “heirs of God and joint-heirs with Jesus Christ.” In view of these things, let us come boldly to the throne of grace, that we may obtain mercy and find grace to help in time of need, while we fight the good fight of faith and lay hold on “the crown of glory”—immortality, the divine nature (2 Tim. 4:8, 1 Peter 5:4). While the special hope of the Gospel age is so surpassingly glorious, and the way to it is correspondingly difficult—narrow, hedged in by hardships and dangers at every step—so that few find it, and obtain the great prize at its end, the new order of things in the age to come is to be entirely different. As a different hope is held out, so also a different way leads to it. The way to immortality has been a way which required the sacrifice [giving up, surrendering] of the otherwise lawful and proper hopes, ambitions and desires—the sacrifice forever of the human nature. But the way to human perfection, to restitution, the hope of the world, requires only the putting away of sin: not the sacrifice of human rights and privileges, but their proper enjoyment. It will lead to personal purification and restoration to the image of God as enjoyed by Adam before sin entered the world. The way back to actual human perfection is to be made very plain and easy; so plain that none may mistake the way; so plain that “the wayfaring man, and those unacquainted therewith, shall not go astray” (Isa. 35:8—Leeser); so plain that none will need to teach his neighbor, saying, Know the Lord, for all shall know the Lord from the least unto the greatest (Jer. 31:34). Instead of being a narrow way that few can find, it is termed “a highway,” a public roadway—not a narrow, steep, rugged, difficult, hedged byway, but a way specially prepared for easy travel—specially arranged for the convenience and comfort of the travelers. Verses 8 and 9 show that it is a public road, open to all the redeemed—every man. Every man for whom Christ died, who will recognize and avail himself of the opportunities and blessings purchased by the precious blood, may go up on this Highway of Holiness to the grand goal of perfect restitution to human perfection and everlasting life. Nor will these be reckoned justified and granted a reckoned standing of holiness and perfection in the sight of God; when started upon this highway of holiness they may go up thereon to actual perfection, as a result of endeavor and obedience, to which all things will be made favorable by their Redeemer, then reigning in power. Each individual will, according to his necessities, be aided by the wise and perfect administration of the new kingdom. This, as will occur to some, is the legitimate result of the ransom. Since our Lord, the man Christ Jesus, gave himself a ransom for all, and desires all to come to a knowledge of the truth, and thereby to actual perfection, why does he not at once make a good and broad highway for all? Why does he not remove the obstructions, the stumbling-stones, the pitfalls and snares? Why not help the sinner back to full harmony with God, instead of making the way narrow, rugged, thorny, hard to find, and still harder to walk in? A failure rightly to divide the Word of truth, and to see that the present narrow way leads to the special prize, and is for the trial and selection of a little flock of joint-heirs, the body of Christ, which, when selected and exalted with their Head, shall bless all nations, has led some to very confused ideas on the subject. Failing to see God’s plan, many try to preach a highway of holiness, an easy way to life, in the present age, when no such way exists, and they confuse and compromise the matter to fit the facts and the Scriptures with their mistaken theories. War continually against besetting sins. This is a pathway of SACRIFICE, as that of the coming age is to be a highway of righteousness. Of that highway it is significantly stated in symbolic language that “No lion shall be there, nor any ravenous beast shall go up thereon; it shall not be found there” (Isa. 35:9). How many frightful lions are now in the way of those who would be glad to forsake sinful ways, and to pursue righteousness! There is the lion of a degenerate public sentiment, which deters many from venturing to obey the dictates of conscience in matters of everyday life—dress, home, and business arrangements, etc. The lion of temptation to strong drink hinders thousands who would be glad to see it removed. “Nor shall any ravenous beast go up thereon.” No giant corporations, organized to advance selfish, individual interests at the expense of the general good, will be tolerated. “They shall not hurt nor destroy in all my holy mountain” (kingdom) saith the Lord (Isa. 11:9). Though there will be difficulties to labor against in overcoming propensities to evil, etc., yet, in comparison with the narrow way of this age, that will be an easy way. The stones (stumbling-stones) shall all be gathered out, and the standard of truth shall be lifted up for the people (Isa. 62:10). Ignorance and superstition will be things of the past, and righteousness will receive its due reward, while to evil will be meted out its just deserts (Mal. 3:15,18). By wholesome chastisements, fitting encouragements and plain instructions, as returned prodigals, mankind will be trained and disciplined up to the grand [page 218] perfection from which father Adam fell. Thus “the ransomed of the Lord shall return [from destruction, by the grand highway of holiness]… with songs and everlasting joy upon their heads; they shall obtain joy and gladness, and sorrow and sighing shall flee away” (Isa. 35:10). for those now being selected to be made partakers of the divine nature and joint-heirs with our Lord Jesus in the Kingdom of glory soon to be revealed for the blessing of all. Such as have this hope—who see this prize—may count all other hopes as but loss and dross in comparison (Phil. 3:8-15).